Did you ride it? I would like to see one and ride one. What I’m picking up from the articles, it has a very low center of gravity combined with an engine that mimics the characteristics of a Ducati twin by tweeking the crank to give the firing geometry of a 90 degree V. The fuel consumption is quite remarkable. Apparently they are becoming popular in parts of the world where motorcycles tend to be used more as vehicles than toys. Could it be a “game change” similar to that from “1911” to “Glock”? I have been riding a KLR650 for the last nine years, so I’m not expecting a ball of fire anyhow. By the numbers, I would buy one as a commuter. What was it,…60+ MPG, as gas prices go up it looks more appealing than my all time best 52. To get that I had to gear my bike so high that it liked to either burn up the clutch at lights or stall. Sure it may not be as sporty as we like, but what new bikes in that price range are anyway? When my Katana was a 750 it got 45ish mpg. After the 1127 swap it was 32. I will take the lower mog and all the fun I can handle. It would make a decent starter bike, for someone like me. Oh, I’ve ridden a number of friends’ bikes, including some of the faster stuff, but neverowned one. The drop in my fuel bill from $300 a month to $68 would damn near pay for it. Motorcycles are fun, but they are only cheaper if you sell your car. This is why I buy the bike outright and suffer no monthly payment. I’ve saved easily 300 a month is gas over what I was getting in my truck. But that amount has been dipped due to my gear purchases. But once you buy the gear, that’s it. My insurance is 100 bucks a year. For both my bikes. I am an avid rider and I don’t make payments either, but in this calculation you still need to amortize the cost of the bike. I buy a bike outright because a wise man once said… “Never race anything you can’t afford to light on fire and roll down a hill.” I think that applies to anything as adversely affected by gravity as a motorcycle as well. That’s exactly how I feel too. I get hives just thinking about financing a Car. A Bike? NO WAY. It’s far too easy for a boot to slip on a tiny bit of Gravel and there it is… your bike on the ground. Not to mention any of the other threats to a motorcycle. One advantage this Honda could have… thanks to it’s Auto based engine… is much greater longevity. Meaning if you see one for sale on KSL.Com or Cycle Trader in decent shape, it just might have a good long life ahead of it still. I know guys that buy new bikes after only 25K Miles because they think their bike is about worn out. On some bikes, that just might be true. On this one… I bet it might go a lot farther. Of course, I buy and sell bikes far too often… always have. Because I’m a Bike Whore, just like I’m a Gun Whore. The State of Utah once told me that I needed to get a Dealer License if I’m going to continue to buy and sell cars. Of course, I’ve not done that since College when it comes to cars. 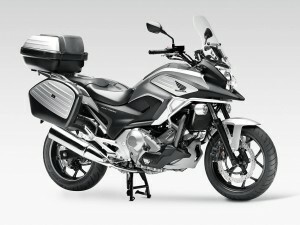 I kind of like it, but it doesn’t really look all that different that my Suzuki DL650 V-Strom. It’s the ’10’s version of a CX500 – it’s for old guys in gold, nylon windbreakers and a 1970’s era visorless helmet with a grocery-crate bungied to the tail-section. I saw one at the stealership today, kept my distance… didnt want to get any on me. I own it and absolutely love it! Yeah, it’s not going to win any races, I get that. But I just took a 2 day trip on it logging 823 miles while only sipping 13 gallons of fuel. I even rode the famous US129 “tail of the dragon” route and had no issues dragging the silencer and pegs with much comfort. I would buy it all over again in a heart beat. 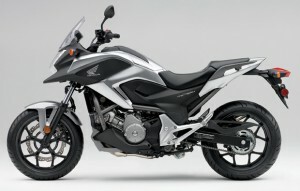 Honda got it right with this New Concept bike. I became very interested in the NC700x only by chance of reading how well it did against the BMW that’s at twice the price of the Honda and weight. The weight of the BMW during this race called the DACARR or something like that caused the BMW to get stuck in the sand! more times than the article wished to publish. The guy riding the Honda used the extra 7G they save on the Honda to by a Gold weaved jacket so it would be bright enough for the BMW to signal him back to pull him out with his ball-less testosterone raging torque. the best part the Honda was the film crew or some thing.